The argument of the adult kick scooter, who made the call and said that scooters are only for kids? Whoever they were they were completely wrong. As human beings we love the sensation of gliding, that longing has been targeted by so many different forms of recreation and transportation. Think roller blades, ice skates, skis, snowboards and of course SCOOTERS for adults. 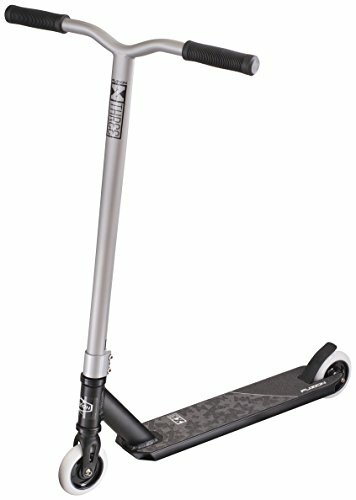 Just because you’re an adult that desire to glide doesn’t go away not to mention getting around via scooter is a convenient and reliable way to travel from point A to point B. The only problem that comes with mixing scooters and adults is selecting the appropriate scooter. Adults who have purchased kids scooters and ridden them like they were built for them are the ones who ultimately think that scooters are only for the younger audience. Many of the scooters on the market are developed for children and aren’t built to meet the demands and needs of a full grown adult. Why Ride An Adult Kick Scooter? 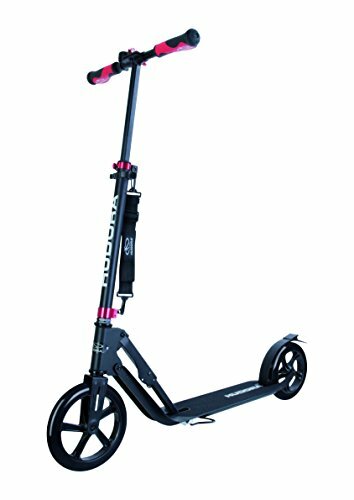 Should you get the Xootr adult kick scooter? How to do Tricks on an Adult Kick Scooter? How to Make a Kick Scooter Faster? What Are the Best Adult Scooter Brands? If you don’t want to do a lot of reading we’ve summed everything up in the ProScootersMart version of cliff notes. These top 3 scooters were chosen based on quality, price, features and customer support after the purchase. Whether you decide to go with Fuzion or Razor you really can’t go wrong both are reputable brands based in the United States. Adult Kick scooters are amazing all around, not only are they convenient for quick trips and tons of fun on the weekends but they have other benefits that are often overlooked. Looking at the big picture how do scooters accomplish more than what meets the eye? Think about the carbon imprint that riding a scooter leaves… oh wait it doesn’t leave on at all. Yeah you got it riding a scooter doesn’t contribute to the pollution that cars and other motorized forms of transportation leave. Also think about the personal benefits that come along with scooter riding. You’ll be getting off your rear end that you most likely sit on all day at the office. This light exercise will have a great effect on your overall health. Lower blood pressure, cholesterol, and weight loss all can be attributed to regular scooter riding. Last but not least stress, the silent killer can be relieved with scooter riding. You may be asking how is that? We’ll answer that with a rhetorical question: How many minutes of traffic do you experience in your work commute? Getting from behind the wheel and getting your body in motion will pay dividends to your metal outlook. During the development of this article we rode the various folding kick scooters for 3 months straight comparing comfort, ride quality, braking, durability and convenience all factors that play a large role in living with a scooter on daily basis and even cruising around on the weekends. FOR BIG KIDS AGED 8 TO 108+! 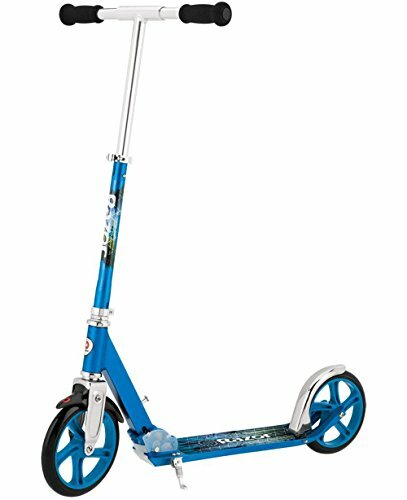 With large 7.9" Wheels, 13 Inch Scooter Deck, 14" Wide Handles, Height Adjustable T-Bar and Aircraft-Grade Aluminum you can see why this Fuzion Scooter is the most solid ride for grown up kids! Can it handle you? If you're between the age of 8 and the size of 220lbs, 6ft 2", and shoe size 12, you're good to go - fast! HIGH SPEED OVERSIZED WHEELS: When you're trying to get to work on time, or zip around campus adult scooters with big wheels glide over cracks and dips, instead of getting stuck! The Cityglide push scooter has large 200mm 88a PU Wheels, Strong Alloy Core and Smooth ABEC-9 Rated Bearings so you can zip around the urban jungle like a kid! PORTABLE, FOLDABLE SCOOTER: While it may be too big to stuff into a small backpack, the Cityglide adult scooter comes with a comfortable SHOULDER STRAP for portability. 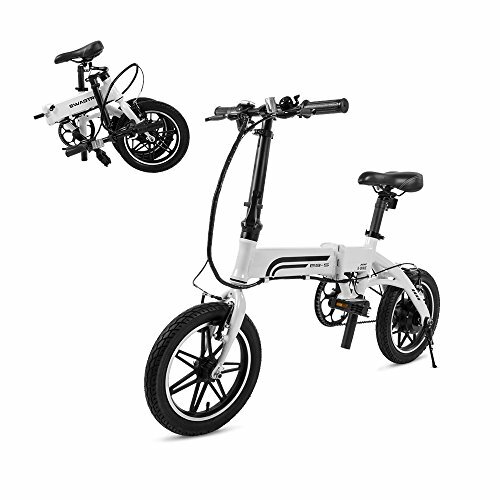 Well known as "the easy to fold up scooter" it folds to a compact 29.5 x 15 Inches, and is a 10lb lightweight scooter. Take it anywhere, and everywhere! EASY TO ASSEMBLE: Fuzion Cityglide Kick Scooters come securely packaged, and when yours arrives, you'll simply tighten two screws and off you go! Shave time off your daily commute or get to class on time - maybe even early for a change! Popular with city dwellers, college students and even younger kids who need cool scooters for transport, not tricks. 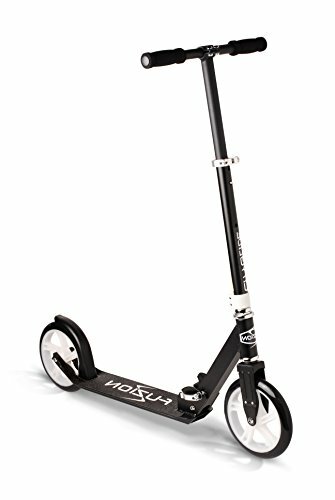 The Fuzion CityGlide is the first scooter that we are going to discuss, this scooter is a great option for an adult looking to grab a scooter and start riding. CityGlide was in fact designed to be superior to the Razor A5 Lux. The B200 version of the CityGlide took that goal to new heights by adding a handbrake to this scooter segment typically something reserved for bicycles and motorized scooters. As an idea Fuzion was way ahead of the curve because the next scooter to offer a hand brake didn’t come out until almost 2 years after the CityGlide. Let’s get down to the facts, Fuzion CityGlide weighs in at just under 10 lbs which is light yet sturdy enough. If you are a rider who weighs more than 170 pounds you might want to be cautious and look to a different scooter as the weight limit on the CityGlide is 170 pounds. Deck size is a serious consideration when buying a scooter as the deck is where you will spend the most of your time standing. You want an adequate deck in width and length for your individual size. For a smaller person the CityGlide is more than enough however if you are a larger/taller person a different scooter on this list might be better for you. Adjustability on the handlebars is probably as important as the deck size because the height range of the handlebars will relate directly to how comfortable you will be while riding. With that said the CityGlide has a max handlebar height of 37 inches from the ground. Big wheels and smooth bearings are a vital component of how your scooter performs. A higher quality bearing is going to give you a effortless ride requiring a lot less kicking and leg work. Durable big wheels will allow for you ride your scooter for months even years on end without wearing your wheels down to the hubs. Overall the CityGlide has middle of the pack wheels and bearings. Definitely not the fastest bearings nor the most durable wheels but they do get the job done. After 2 months of riding the Fuzion CityGlide our conclusion is that it is the best value out of all the other adult scooters that we tried. The price on this thing is unbelievably great and delivers everything a rider could ask for all for under $65 and you just can’t beat that! Fuzion also offers a great warranty on their products and deliver great customer service. What could be improved: In a perfect world the Fuzion CityGlide would have higher quality components but in particular the hardware. We went through a few bolts stripping in our time of riding and servicing the scooter. Razor is for many in the United States the king of kick scooters, they ultimately brought them to the mainstream audience over 15 years ago. The A5 Lux really rides that wave of exposure down to this very day. While it is heralded as the top adult scooter out there it really isn’t much to write home about. However the one thing we have to admit is that this thing just WORKS. Out of all the big wheel scooters we tested the Razor A5 probably had the least issues and was always there when we needed it to be. The experience that Razor carries into the scooter industry comes into to play with the different iterations of this scooter. Originally it didn’t come with a kickstand but now it does. Also when it was first released the folding mechanism was clunky and overly complicated nowadays it’s a simple pull button that is both functional and convenient. While the latest rendition is graphically challenged and not very elegant it gets the job done being available in two distinct colors blue and pink. Another way Razor does a good job in producing the A5 is in the hardware and components. Everything that they do is solid down to the minute details. Small Razor logos appear all throughout the scooter. The scooter requires zero assembly as they got rid of the old school clamped handlebar stem still present on the aforementioned Fuzion CityGlide. All in all the Razor A5 Lux is a great option for an adult looking for a scooter to enjoy in leisurely activities or for commuting back and forth to work. One reason why this scooter ranks high in our minds is that it is very easy to find. You go to Target to pick a few household items the A5 is there by the bikes. You’re rolling through your local Walmart there it is again chillen next to the Madd Gear Extreme kick scooter. Oh wait you’re an online shopper major retailers across the next including Toys R Us, Best Buy, Walmart and the king of them all Amazon carry the Razor A5 Lux. What we would like to see: on the Razor is a nicer finish, maybe larger wheels, better finishes and more color options. 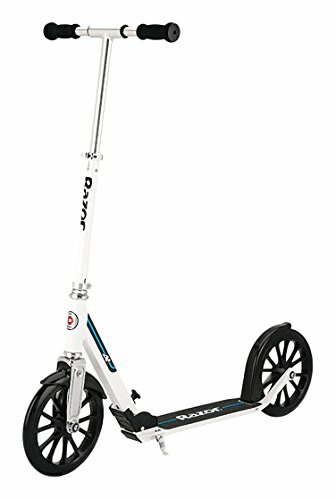 Since this scooter is the consumer choice for “Adult Scooter” it should be a little more adult. Just our humble opinion. They must have spies or people watching us because everything we said we’d like to see Razor do to upgrade the A5 Lux scooter is exactly what they did when they released this beauty…enter the Razor A6 Scooter. Sophisticated, grown up and functional the A6 crosses every “T” and dots every “I”. When we first laid eyes on the A6 the thing that really jumps out is the cleanliness of the design it is very minimalist which is very much our style. The large wheels on this scooter also really appeal to the audience who would be interested in buying it. A big wheel does a few things, for one it’s going to allow for a faster ride and secondly yet most importantly less issues rolling over debris and rocks that somehow find their way into every path you’ll ride your scooter down. No expense was spared in designing a true scooter for adults with the A6. Everything about the scooter is BIG, it is one of the heavier scooters we tested coming at 12 lbs. Great for taller riders the handlebars will adjust up to 42” which is a 4 inch improvement over the classic A5 Lux. Deck length has also been extended on this scooter, this deck is 13.4 inches in length while a comparable scooter in this test would only be around 13.2 inches. The difference doesn’t seem very important but on a folding kick scooter even millimeters will make a world of difference in comfort and performance. Probably our favorite aspect of this scooter is the attention to being tight and well put together. Most scooters rattle and this one does probably the least amount of rattling we’ve ever experienced. What we would suggest: Really nothing could be improved too much on the A6, however you are playing for every luxury and advantage that this Razor is giving you. This is the best scooter on our list but also one of the most expensive. If money isn’t a thing then by all means check out the current prices and grab an A6 today. Cast aluminum frame and unique design supports over 800 pounds. Micro-adjustable telescoping handlebar, accommodates adults up to 6' 7". 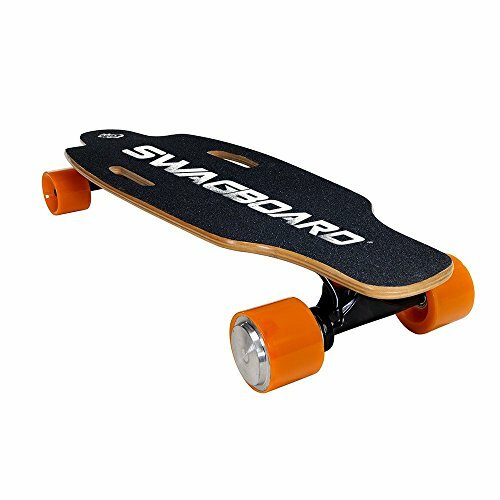 Wide, long platform is sized for real adult feet and provides enough room for both feet to fit side by side while cruising. Patent pending QuickClick latch folding mechanism allows folding/unfolding in seconds. Compact folded configuration allows the Xootr to be easily stowed or goes with you on the bus, train, office, classroom, etc. Limited lifetime warranty (excludes wear items). All components are replaceable. Each scooter is carefully hand assembled in Old Forge, Pennsylvania. You can contact us by phone or email and speak to us directly at our facility if you ever have a question, concern, or problem. Building scooters since 2003. 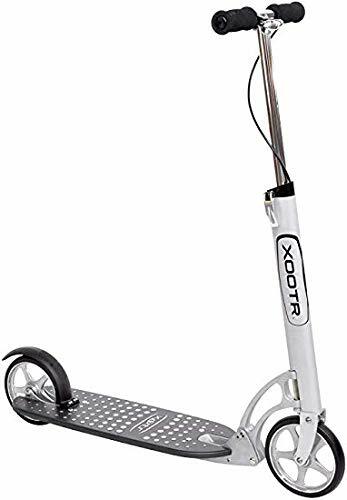 Xootr took a unique approach when it came designing their scooter for adults. While many of the other scooters in this segment fit the average sized adult this scooter will accommodate larger people even up to 6’7″! 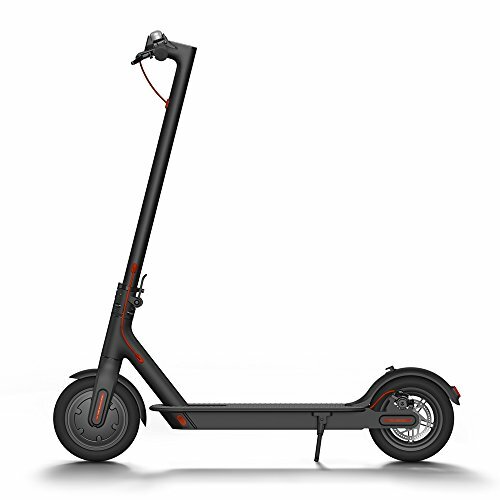 Not sure how many people that tall are looking for scooters but the Xootr Mg has them covered. What about the other features? It’s safe to say the Xootr adult kick scooter performs remarkably well in every category! 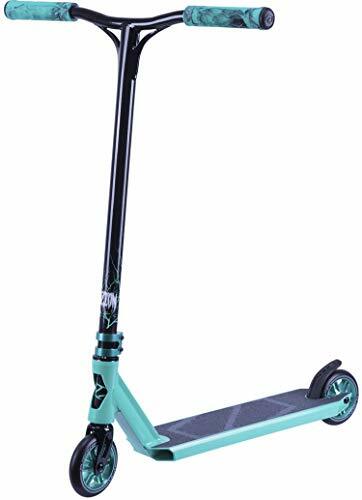 Tall adjustable telescoping handle bars, full cast aluminum frame, extra large/wide deck (7.4 inches wide & 25 inches long), easy folding mechanism, front hand brake and rear fender brake. It’s easy to see the Xootr adult scooter is very well equipped with just about ever feature possible. However, all these features don’t equate to the perfect adult kick scooter. What we didn’t like about the Xootr mg is the hand brake being on the front wheel. With the front wheel being slowed by the handbrake, if used at relatively high speed a rider could be thrown over the handlebars onto the ground. Once used to the setup one could easily avoid pressing the front brake but something that can’t be avoided is the price tag! 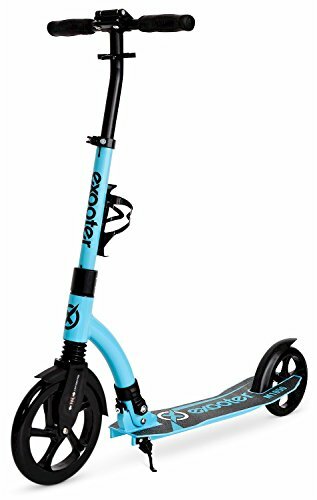 This scooter comes in at a whopping $279.99, with such a lofty price tag you could buy almost 2 of any other model on the list. 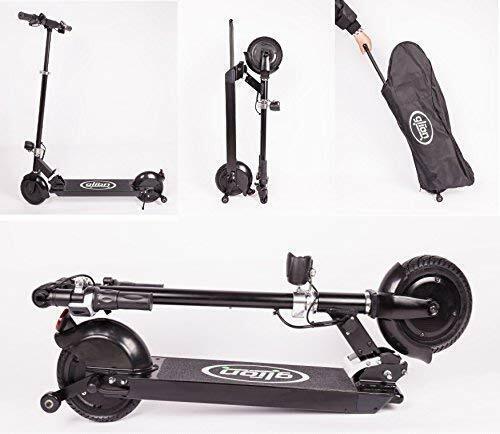 Unless you are a very large person (the xootr adult kick scooter supports up to 800lbs) opt for one of the other scooters like the Fuzion CityGlide or Razor A6. You can get two for the price of just one xootr. To break up the monotony a little bit we are going to throw a little curve ball into the conversation. Maybe you want a scooter for the weekends just to get out and feel the windy blow through your hair. If this is the case then you don’t need a folding mechanism, you don’t necessarily care about weight because you’re not going to have to carry your scooter around. If you were shaking your head yes and nodding in agreement then the Schwinn Shuffle is the ideal scooter for recreational riding. What’s the difference between the Shuffle and the typical kick scooter? While both scooter segments are propelled by kicking the differences are large and automatically distinguished by first sight. This scooter is more modeled after the original bmx style scooters from the late 80’s but with a twist. A traditional bike style wheel fits on the front fork of this scooter. In the rear similar yet downsized bicycle wheel with real inflatable tires in the front and rear. Think of the Shuffle as a beach cruiser mixed with a scooter, while it might look a little strange this scooter is a ton of fun take them to your local trail and have a blast. However remember that these things are big and will require a truck, van or bike rank to transport them. Because of their large size and inflatable tires the Schwinn Shuffle comes with quite a bit of draft. So kicking this scooter is going to give you a real workout it’s not as quick as the traditional kick scooters on our list. 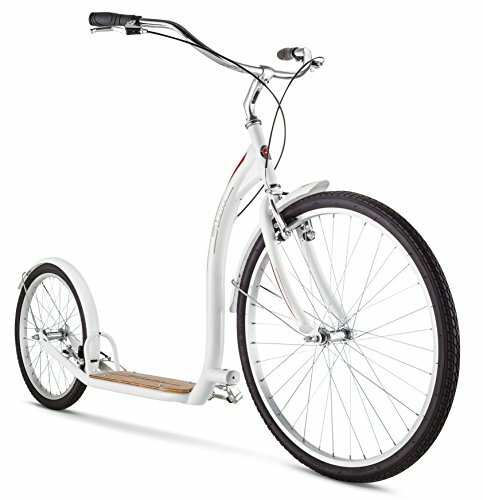 Great for adult fun, made from solid parts including a full on steel bike quality frame and wooden deck. What we think: We actually like the Schwinn Shuffle for what it is, a leisurely scooter for beach cruises. However to have to ride this bad boy with a purpose and get from one destination to another…frankly that would be a nightmare. We couldn’t even imagine lugging this thing onto a bus. Although a little different from the competition the Schwinn is the most expensive scooter in our guide. Distinct to Globber, it is the first ever innovative foldable clamp design that allows riders to fold the scooter within a second. It allows the rider to put the scooter in self-standing mode or go all the way down to trolley mode for easy storage after use. Globber took to naming their latest adult scooter offering after it’s most notable feature. An all new folding mechanism advertised to be completable in 1 second. But does the scooter really fold up in 1 second? We will answer that at the end of the section but for now let’s talk about the details. To start we were blown away by the deliverables on the Globber. It’s quite possible that they thought of almost every possible thing to include on a kick scooter. Upon first receiving the scooter we couldn’t help but notice that they decided to go with a molded deck platform. Similar to what made them famous the Globber 3 wheel scooters, this adult scooter features a plastic molded deck design. Opting for the material changes was a risky idea because of durability concerns but so far so good, we saw absolutely zero negatives to the plastic deck in our entire testing period. We spoke briefly about attention to detail and now we will dive into this topic in depth. Globber included just about every bell and whistle to this scooter model. That saying is actually literal in reference to the Globber One second. This scooter includes a real life bell on the handlebars to let people you share the road with that you are coming. Bells are often found on bikes but with the emergence of more and more scooters this was a good simple innovation. Safety is a growing concern with the rush that many people are in these days the more tools a scooter rider can utilize to become as visible as possible are welcomed. To pair with the bell Globber also added a reflective pattern design up the front of the steer tube and a reflector above the rear brake. Both of these additions help a rider to become as visible as possible to oncoming and trailing traffic. Globber adding these features really catapult the scooter into the conversation for night travel something that had never been addressed in the past. Before a rider would have to rely on strapping on flashing lights or wearing reflective clothing. Getting back to general scooter features the Globber One Second has large 230mm wheels adding stability and the ability to roll over debris. A real adults scooter the Globber is rated up to 220 lbs, the handlebars are also made for full sized people with an fully extended height of 46 inches suitable for 6’6” individual. Our overall impression: You were patient enough so the Globber actually folded down in 2 seconds but the gimmick of one second was a good marketing ploy. We can’t say anything negative about the Globbers overall design however the lever braking system should have been left off. It is too grippy and is honestly more trouble than convenience. Good scooter at a good price check the current pricing here. Buying a scooter is more than just looking at picture and clicking add to cart you should know what you’re getting into in advance. Our review points should assist in this area but also consider the following arguments will also get you mind going in the direction of thinking your purchase through for your individual circumstances. 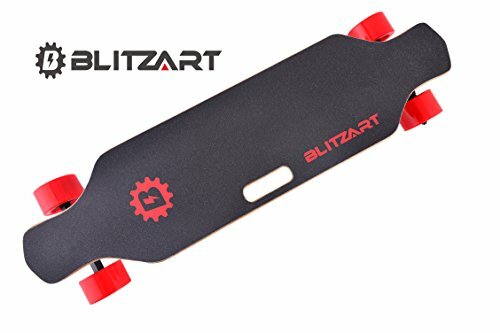 While browsing online for your next scooter you’ll see all kinds of great low price deals which might be appealing at first glance but sometimes these purchases can come back to bite you in the long run. To avoid any issues down the road opt to get a scooter from a reputable brand like Razor, Fuzion or Schwinn. Buying from the major players in the market will guarantee you can reach someone in case you experience any problems with your big wheel scooter. All of the brands above have real customer service departments that you can call or email at your convenience. The established brands are also going to produce replacements parts so when your scooter needs new wheels or a clamp you’ll easily be able to get a new one. On the other hand when you have a scooter from Joe Schmoe losing a part might sideline your scooter indefinitely.While you may have only paid $30 for the scooter it lasted only a few weeks while a scooter you pay $70 for will last years and is backed by a manufacturer warranty. Unless you are pure weekend leisure scooter rider looking for something like the Schwinn Shuffle you are no doubt looking for a scooter that is reasonable in size and is easy to travel with. After testing so many scooters and taking them on public transportation as a part of the testing size and weight play a large role in satisfaction. From our experiences a scooter that is 10 lbs or less is perfect for commuting and travel. Anything over the 10 lb limit starts to be work and most of the scooters on this list lack a shoulder strap except one and that perfectly transitions us into the next scooter on our list. High density durable aluminum alloy and precision technology with strong and security，the max rider weight is 264.5lb， it's a safe and comfortable experience for adult and child. A big wheel design scooter will provide a feeling of gliding for adult and child. German Scooter Juggernaut Hudora is next up on our list with the 230 Scooter. The name goes had and hand with the size of the wheels 230 millimeters which is larger than the standard size for this segment. The lower priced scooters ala the A5 Lux and CityGlide both feature 205 mm wheels however what separates the Hudora Big Wheel from those scooters is its very unique folding mechanism and of course larger wheels. This easy folding mechanism is both efficient and quick however it is clunky and takes up quite a bit of usable deck space. For riders with large feet this could pose a problem but works fine standard shoe sizes up to men’s size 11. Diving further into the Hudora’s features this scooter has just about everything that a rider can ask for. From the shock absorbent hand grips to the spring loaded kickstand this scooter is well equipped. At the end of the day though the Hudora isn’t anything groundbreaking unless you absolutely love their folding mechanism and of course the carrying strap. Other than those features this scooter is basically a Razor A5 with a little bit of German engineering. What we would upgrade: The Hudora Big Wheel Kick would be a monster in this category if it had a handbrake and reflectors wouldn’t hurt either. With the resurgence of the scooter into the mainstream market, rider safety is going to be a focal point in product development. Look for brands to start understanding this and innovating in this area. Bonus: Sleek self adjustable bottle holder for up to 32oz beverage. Feature: Solid spring-shock kick stand for easy folding and unfolding. We really liked the Exooter scooter, the concepts and ideas put into this scooter show a lot of forethought and attempted innovation. The people behind the Exooter Brand literally tried to think of everything when they designed the 6XL scooter. This scooter has just about every feature used throughout the entire test group with a few outliers. Basically, this scooter does everything well but nothing is great or mind-blowing. It features a wheel offsetting with a big wheel in the front and smaller wheel in the rear we aren’t quite sure what benefit it offered as we couldn’t tell a difference. Thinking in regards to the laws of physics the only benefit it should provide is added work in kicking and less overall speed. Handlebars adjust to a maximum of 38 inches which is right in the middle of the pack of the scooters we tested. The unique folding system is also a little bit clunky and hard to operate at times. While this isn’t a deal breaker there are much better options available. One of the standout features on this Exooter is the vibrant colors and designs. This is probably one of the more attractive and polarizing scooters on the list. Another key area that everyone seemed to enjoy was the bottle holder. What will everyone need after a 3 or 5 mile scooter ride? Water! Equipping this scooter with a convenient easy to access bottle holder was a real solid idea. What we’d suggest: After riding this scooter all it really needs is a tweak or two to the folding mechanism and some reflective features to boost it up our list. However if you are drawn to the scooter from its looks or bottle holder selecting it won’t leave you disappointed. You may have never heard of the dog powered scooter but is an awesome scooter that creates a great activity to be enjoyed by a man/woman and their best friend. Some of us own hyper super active dogs or breeds that are hard workers but with living in suburban environments robs these dogs of their passion. The solution could be you move to the country and get a place sitting on a few acres or you could invest in a dog powered scooter! Option #1 could cost a few hundred thousand dollars but option #2 starts under $700. At Dogpoweredscooter.com you can find the perfect system for you and your pet. There are three different models available with the best being their custom design, that is both ergonomic for kicking and safe for your dogs. All dogs must be in their prime or younger if you expect them to pull the full weight of the unit/rider for any sustained period. Dogs older than 10 yrs. should generally NOT be regularly exercised in these vehicles. The dog’s pace should be of their control and not that of the rider. The maximum rider weight (to expect the dog to pull, and power the whole unit) is 100 lbs. more than the dogs’ weight. (for exp. if the dogs’ weight is 50 lbs. the max. rider weight should be 150 lbs.) If there are multiple dogs you would add up the total dog weight then add your 100 lbs. The rider needs to always help when going up any grade of slope. Generally, let the dog set the pace and only use some scooter kick tugging on the harness and or vocal encouragement for motivation. Tires should always be inflated at the max. allowed and “feel” hard. Following the above rules and using common sense like bringing water, giving the dogs a break reducing distances of “Dog Mushing” on warmer days over 70 degrees are all best practice and will leave your pup wanting more! How far you can fo on a kick scooter depends on a few variables. The first would be your personal fitness. If you are a relatively fit person you should able to go quite a distance riding a scooter. Let’s say if you can run two to three minutes without stopping you’ll be able to go 4 to 5 times as far on scooter under the same amount of stress. The second variable comes into play at this point though. What are the road conditions where you will be riding? Sure you might be able to go 3 miles on nice smooth paved streets but if you are in a rural area you might not be able to go even 10 feet comfortably. So we recommend scoping out your route before planning on taking a scooter through it, in our months of testing various scooters there we plenty of times where walking the scooter for a few yards was called for but taking the scooter for the other 80% of the trek was amazing. All in all, we’d say any more than 4 or 5 miles might be a little too much for regular kick scooter trips. Then again remember its based on each individual’s fitness and the last variable. Weather conditions like pavement play a large role in scooter travel. If you live in a place with pleasant weather like California riding a scooter as far as 5 miles might be a piece of cake however if you live in more moist areas like Seattle with tons of rain or even Florida with lots of humidity you scooter travel distances can we dropped dramatically. Unless you are bombing down hills scooters aren’t know for their death-defying speeds. 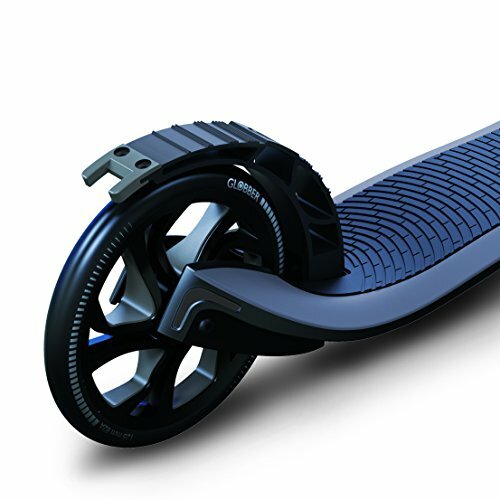 With a nice set of upgraded bearings and a few firm kicks, riders can expect to reach speeds of up to 8 or 9 miles per hour. If you need to go faster you should look into an electric scooter! While tricks are typically reserved for Stunt Scooters some crazy scooter riders have been known for taking these big wheeled scooters to the skateparks and doing insane tricks on them. While we don’t recommend you try any of this at home enjoy the following video showcasing some of the tricks possible on adult scooters. There are no superchargers, camshafts, turbochargers or nitrous available in the scooter segment. With no forced induction options how does one get more speed out of their scooter? Really the only way to do this is keeping your scooter serviced with lube and tightened appropriately. Another option you have is to upgrade the bearings, none of the scooters we tested had premium bearings installed. Opting for a Swiss made bearing or at least a higher end Chinese made bearing and running these on your scooter will increase the spend and the need for excess kick propulsion. Now that you are interested in getting a scooter you do want to make sure that you select a good one. Sometimes we believe that we are getting the best deal because the price is lowest but thinking about the value is more important than an initial low price. Value is the wear and uses we get out of something compared with the price. To illustrate if you buy a scooter for $49.99 ride it for 2 months and it breaks down and you get another one to ride another 4 months then that one breaks down. Up to this point you would have spent a little over $100 for 6 months of scooter riding. Compare this scenario with if you would have bought an $89 scooter and ridden it for 10 months until it needs service that the brand delivers free of charge. Everyone would agree that the second case is the optimal one, this is the difference between buying from a reputable brand and a run of mill online startup. Reputable brands like Razor or Fuzion are going to have great customer service programs to make sure you are completely satisfied with your purchase. Other brands like Schwinn a legendary bike brand is also going to be a safe bet. However be careful buying lesser known brands as they might offer a lower initial price but leave you high and dry in a case of need. You got a new adult kick scooter and commute to work or a store and you don’t want to bring your scooter inside or maybe it’s inappropriate to bring your scooter inside. So what do you do? Similar to the way you’d lock up a motorcycle or a bicycle you can lock a scooter up with a cord style lock. The problem is that many of the bike locks are going to be too large to where you don’t wanna lug them around, Or they are simply too heavy. The Scooter Lock by KNOG is small enough to fit in a jacket pocket and the perfect size to lock down whichever scooter you select to get. 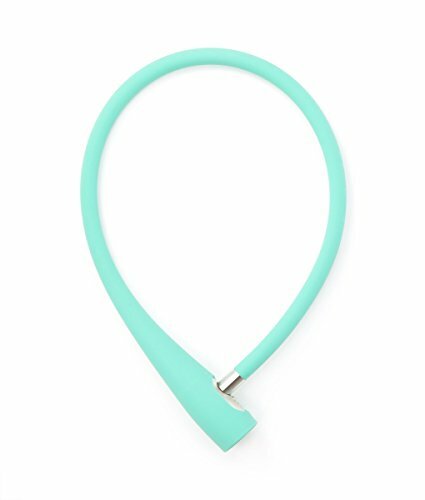 The cable lock by Knog is a great option that meets all of the above requirements. You’ll feel secure as stop sign posts and other poles all transform into the perfect anchors for securing scooter or if your kids are riding their scooters to school this lock also works perfectly on bicycle racks.